Just wanted to let you all know I've updated my sort of "tutorial" for this project on my blog!! Here's what you can do with some nice plywood, PVC pipe, black spray paint, fabric, hot glue, threaded rod & misc. hardware. I am SOOO excited about our cupcake stand!!! And you wanna know the coolest part about this thing ladies (and guys, if you're reading) :-) The fabric panels slide out and can be interchanged so it can be reused for other weddings or holiday parties!!! Eeek! It's actually not 100% done, we plan to trim it in black ribbon and maybe some pink ribbon & bows around the centers, but we'll see. The scary looking hook thing at the top is an ornament display, which we may use as a cake topper. Very well done! 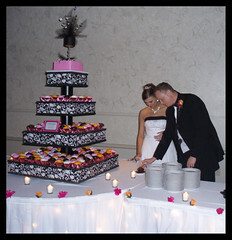 Be sure to post pictures after you've filled it with your cupcakes & hung your topper - I'd love to see it in action. brilliant! I really love it! I want to make one for my DD's first birthday! I have a craft blog,too. Gorgeous! And I second the request for in-action shots on the big day. I love that you can change out the design, too. It'll be perfect for holiday gatherings. I will be more than happy to post "in action" photos when they're here! And, if I can find enough time I plan to type up some detailed instructions with photos. We honestly kinda made it up as we went along. Luckily my FH is very handy and has lots of fun tools. 2 sheets of spray painted plywood tiers: 32" x 32", 24" x 24", 17" x 17", 12" x 12". One 4' x 8' sheet was enough, and we had Lowes cut them to size. The undersides are routered so the panels slip in and out. PVC risers are about 4" in diameter and around 3.5" in height. 2 yards of 44" or wider fabric will cover all panels. 6-8 knobs to put on the bottom for feet. You'll need a threaded rod to go all the way through everything...I think ours is around 3.5'. You'll need washers and nuts sandwhich it all together securely. If you do not want to hassle with routering out the layers so you can slide the panels you can make them equally sized to the layer they will be on and glue, nail, or staple them. You can cover the edges with 3/4" ribbon or trim. I will warn you though, we certainly didn't save any money by DIY (but who knows how much something like this would cost it you bought it already made, right?). I just like the challenge of trying to DIY, plus you can make it TRULY yours in any style you like that way. :-) But, I think we made it for about $150 not counting the other two fabrics I purchased but didn't use...(oh well) or the multiple hours the two of us spent on it. I'm sure you could do this on a much smaller scale for a lot less. Since it's for our wedding it is important that we make it sturdy enough to hold everything and look nice. Plus, we put it in one of our spare rooms and I think it will be a nice artsy piece of furniture to hold little photos and things. :-) We'll get our use out of it. I love that you can change out the panels for different occasions! Very innovative.